At the Children's, our intensive care teams work year-round to provide the highest level of care to our sickest patients, all while training tomorrow's leaders in the field. The greatest difference between working in Canada versus Thailand – despite the much colder temperatures – is the multidisciplinary approach to patient care, says Kantara. “In Thailand, the team is made up of a physician and a nurse, whereas the approach here is much more specialized. You have a nutritionist, social worker, respiratory therapist, all working together with a physician and a nurse…in terms of patient care it’s a lot more interesting,” she explains. The beauty of Kantara’s role, she says, lies in her quest to provide balanced, holistic care care to patients and families. “Unfortunately, not all patients go home in our unit,” she says. “The challenge is to not only think in terms of curable diseases, because sometimes there are no medical cures. 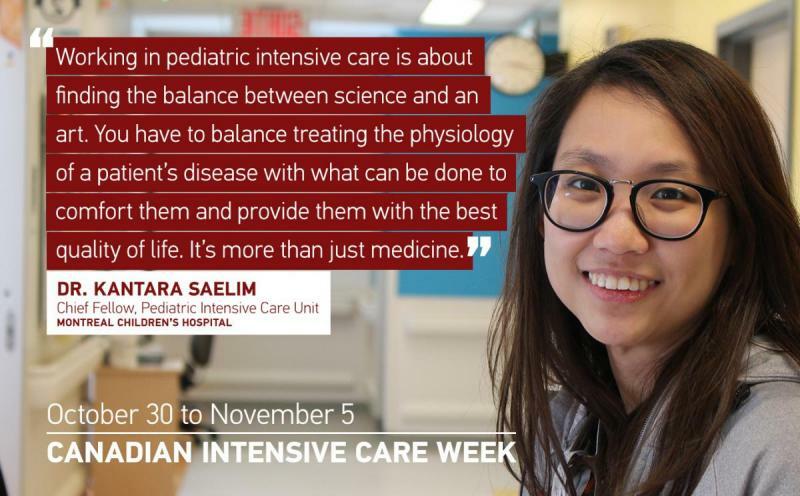 Working in pediatric intensive care is about finding the balance between science and an art. You have to balance treating the physiology of a patient’s disease with what can be done to comfort them and provide them the best quality of life. It’s more than just medicine." 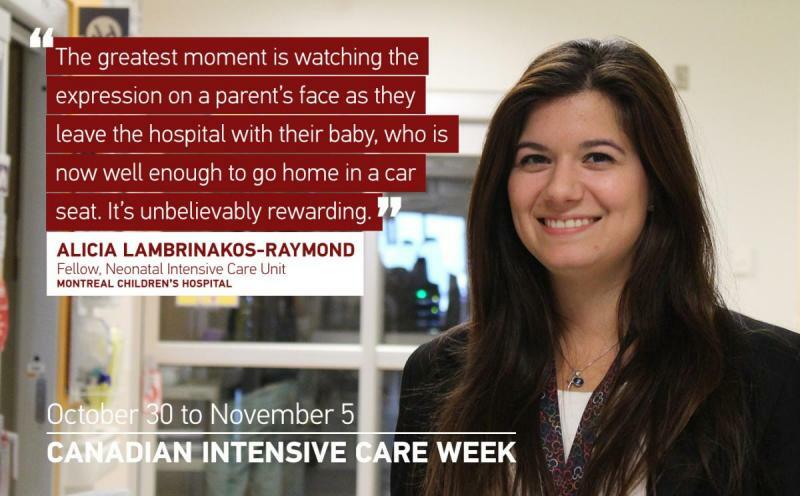 “My first time ever examining a premature baby, I was a 3rd year medical student,” says Dr. Alicia Lambrinakos-Raymond, a 2nd year fellow in the Neonatal Intensive Care Unit (NICU) at the Montreal Children’s Hospital.“I remember feeling terrified that I would break the baby…I laugh at myself about it now!” Since that time, Alicia has cared for hundreds of premature infants – some as tiny as 500 grams --from the time they are born until they grow strong enough to go home, and is now completing highly specialized training in neonatology to become a NICU specialist.